Here’s a great deal: Uber and Gilt City are teaming up to offer a packages of unlimited uberPOOL rides in New York City. 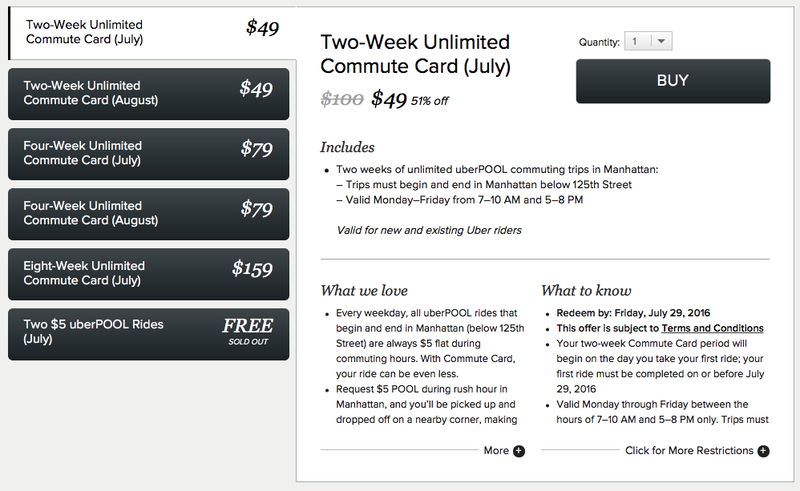 The deal is being called a “commute card” and can only be used Monday through Friday during commuting hours (7-10am and 5-8pm) in Manhattan. These are the same hours during which Uber offers $5 flat rate uberPOOL rides in NYC. As a refresher, uberPOOL is Uber’s carpool product where the company matches you with riders headed the same direction. The packages are either two-week unlimited for $49, four-week unlimited for $79, or eight-week unlimited for $159. These prices equal saving of up to 60 percent off (the packages would normally be $100, $200, and $400 respectively, assuming you take two $5 POOL rides a day). Better yet – this deal means commuting in an uberPOOL is cheaper than taking the subway. A monthly unlimited MetroCard is $116.50 (compared to Uber’s deal of $79), although an unlimited subway card can also be used outside of commuting hours. The deals can only be purchased on Gilt, which is a big score for the discount shopping and experience site. While Gilt does frequently offer packages like this for young startups looking to acquire new customers, it’s rare to see deals for 60% off an established service like Uber. It’s also not clear if this is a deal that Uber will continue to offer after July and August, which is when the packages are valid. Presumably the company is using it as a marketing tool to recruit new users to POOL, which is a service that benefits tremendously from economies of scale. The more people using POOL the better the chances are of a two riders being matched, which saves everyone money – including Uber. The packages went on sale today, and while there are thousands available, will more than likely sell out soon.